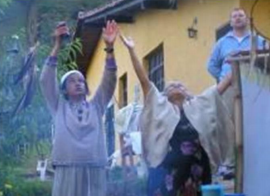 A solid professional testimony about shamanic methods of healing for Multiple Sclerosis, Degenerative Diseases, Depression, Schizophrenia, Drugs and Dependency on Medicaments with the Sacred Power Plants(Ayahuasca, San Pedro, Tobacco, Guayusa, etc.) used in native American Shamanism. Soul loss is regarded as the gravest diagnosis (in shamanism), being seen as a cause of illness and death. Yet it is not referred to at all in modern western medical books. It is becoming increasingly clear that what the shaman refers to as soul loss- that is injury to the inviolate core that is the essence of the person’s being – does manifest in despair, immunological damage, cancer, and a host of other very serious disorders. It seems to follow the demise of relationships with loved ones, career or other significant attachments. My experience of meeting with the Sacred Teacher Plants of San Pedro and Ayahuasca in the foothills of the Andes in Venezuela has been extremely difficult for me to put into the language of my soul. After working with Simon Green here in Avalon for the past year and a half it became powerfully clear to me that to accelerate my healing process I needed to access these medicines, which are well documented to effect curing of immune disorders, depression, alcoholism and addictions. Now that I have experienced firsthand their curing power, I fully appreciate the frustration of healers with the current legislation, importation and ingestion of these medicines. The medicines are a crucial component of the continuing work of their own, the patient’s and the collective process. Those on the waking path throughout the world feel strongly that it is criminal to forbid their traditional shamanic use, but that is a whole other story which perhaps the master of this block will elaborate on further if he hasn’t done so already or you might like to take a look at Dr. Valentin Hampejs’ view on this subject below. 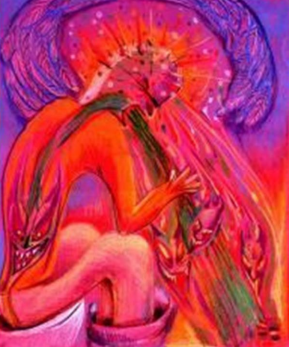 “To be able to liberate the subtle energy scheme (the cellular and reticular memory) of the body from such negative, destructive energies and to load it (“vitaminize” it) with natural vital forces, much deeper and more efficient instruments are needed than those that are at the disposal of the conventional psychotherapy, that is: the employment shamanically administered of the so called “Sacred Power Plants” of the Indian-American Shamanism. incurable for the formal medicine! Why, to tell the truth, should the psychocatalytic or shamanic medicines – that don’t produce any dependence and are characterized by an extraordinary healing power inaccessible for the formal medicine, if they are used expertly by an experienced shaman – be prohibited? ; when such heavy poisons, gravely addictive, as the opium or the morphine can be used legally in our clinics? Maybe only because the doctors don’t know how to manage the shamanic medicines? In the interestfor the health of the whole humanity, the rejuvenated investigation – but now carried through seriously under a competent, i.e. shamanic guidance! – of the healing effects of these psychocatalytic medicines has ended up being from now on an unconditional demand of our time that should not be more postponed. Where was I? …Oh! Yes. Simon, initiated in South American shamanic traditions in Colombia and Brazil, was keen to meet with the sacred plant medicine Ayahuasca again. He found Dr. Valentin Hampejs via an article he had read whilst researching the plant medicines over the internet. This article, written by Alan Shoemaker titled ‘Grace and Madness’ www.chinchilejo.yage.net/grace.html is a lengthy tome at 44 pages but SO worth the read. psychiatrist, and doctor of general medicine. Born, raised and educated in Vienna, Austria. He is the most amazing shaman that I have ever been around. Talking the talk and walking the walk is, in the beginning, a very, very difficult thing to do. We all fall off here and there; I know I do and make no pretenses about it. It is very difficult to maintain when you are constantly visited by friends and family and when you are raising a family. Once my children were born, it became very difficult. Cooking for two different styles of life, for instance, is complicated and expensive. And in the heat of the jungle, there is nothing like an ice cold beer to satisfy you. Therefore, I have not even attempted to walk the walk for years now. I was diagnosed with a demyelinising condition labeled multiple sclerosis. For those not familiar with MS (Multiple Sclerosis), medicos think that the body mistakenly directs antibodies and white blood cells against proteins in the myelin sheath, which surrounds nerves in your brain and spinal cord. This causes inflammation and injury to the sheath and ultimately to the nerves that it surrounds. It frays the nerves. The result may be multiple areas of scarring (sclerosis). Eventually, this damage can slow or block the nerve signals that control muscle coordination, strength, sensation and vision – often leading to complete debilitation. me, as I was very disorientated and fearful. The nausea and dizziness was so overwhelming I was crawling to the loo to vomit. Between the bouts of crawling and vomiting, I just lay in my bed holding onto my neck in an attempt to calm the electrical sparking going on inside my head. By morning, I had been admitted to hospital unable to walk. The vomiting continued. I was paralyzed down my right leg; my vision was failing rapidly, as was my speech and co-ordination. The headache was of phenomenal proportions, with frightening intermittent head tremors and a debilitating fatigue. Turned out that the fatigue would not go away for twelve years. I genuinely thought I was about to die – yes white light was present. Days later, after the onslaught of a battery of neurological, pathological and diagnostic tests (you can imagine how much I was feeling like being prodded and poked relentlessly at this point) it was GUESSED that perhaps I had had a stroke, or may have a brain tumor. After staff delivered this news to us, I recall wafting in and out of consciousness many times, vaguely aware of the grave faces of family friends and medical staff. As I lay in my hospital bed four weeks later, feeling and looking so wasted. my body full of numbness, still unable to walk unaided or see fully, I mused daily “If it’s a tumor, I am off to live in the rainforest, up in the trees with a stream of young lovers, cases of Moet, plentiful ganja and an unlimited tropical fruit supply, 7 beautiful sarongs, one for each day of the week, and my trusty laptop computer (quietened generator installed)” No wireless back then, and sadly I had to forgo the baby grand up in my tree house. I was absolutely determined to get out of the hospital as soon as possible. I escaped twice with the help of family but was politely asked to return each time. I was also determined to be out of the wheelchair, and by using a walker up and down the ward for long slow hours each night of the month I was there, I got strong enough to show the powers that be that I could walk again, using a walking frame. Therefore, they should let me out immediately. However, their criteria for release were related to seeing the MRI (Magnetic Resonance Imaging) of my brain and spinal cord, and my lumbar puncture results, in order to define my condition. eventually spent full time in a wheelchair. Very encouraging… My self-image and self-esteem has always been strongly identified with my physical abilities and here I was watching myself using my hands to lift my 4 legs (I had double vision) onto the bed. When I tried to walk unaided, I experienced a failure of muscle control in my legs, would have to stand with legs wide apart otherwise I would lose balance and coordination and find myself on the floor. This has the charming name of ‘Ataxic gait.’ It is not a good look, nor is it fun. Oh yes, I could not write, hold utensils, bathe without assistance, the list goes on. I liked to move and groove. Not crawl on the floor! (Mind you, crawling to the fridge for food was quicker than attempting to walk!) The dancer in me was deeply saddened by the news. This was indeed a challenge. Over the next months, I cried a lot, I also completely recovered my to walk, and speak. There was an intermittent ability to see through the double vision and therefore drive (I had special glasses constructed) Despite my overall physical weakness and many setbacks my determination to be rid of this condition was, and remained, unwavering. I have had numerous relapses since 1994 with symptoms immediately obvious to others, head tremor, dysphagia (swallowing difficulty), bouts of speech slurring /drooling (nice!) long and sudden onset of coughing and hiccoughing fits. When a relapse occurs it is a struggle to remain positive as you are feeling fearful, terrified actually, of the unknown, the unpredictability, will this debilitate you totally this time, how long will this last, what form will it take this time round? This, compounded by the relapse, hauls you back into another round of grief processing. In addition, the last, but not least, invisible symptom is the constant fatigue. As many brothers and sisters with the condition reading this would readily affirm, the most consistent symptom is that of debilitating fatigue, which can send you to bed for days or weeks and beyond. It is often difficult for others to appreciate the effects the hidden symptoms have on someone with this illness, especially regarding employment. In fact, fatigue is one of the major reasons for unemployment among people with MS.
often expend extra effort on activities-such as lifting legs to walk – which once was second nature. These efforts add to the overall burden of MS fatigue. Fortuitous events found me for the first few years in the loving yet tough care of the late Eric McNally (Eric the Bonecrusher, a Chiropractor & Naturopath) and his committed apprentice Robyn Berkeley. He had been witness to my rapid deterioration in hospital and instructed my family to get me home, so we could begin treatments that would initiate the return to vitality. During this time at home, I finally picked up the MS books concerned friends had left for me by my bedside. The literature seemed to list endless possible exacerbations and how to travel fearfully towards a decline into a wheelchair and then eventually death, all reinforced by the medical perspective. When I had exacerbations, I never went near an injection or a hospital. I never returned to my job in Information Technology, which had been most of my life, as I was consumed with working. It was not long before I released myself from my denial of my unhealthy lifestyle and relationship as well. I knew I had to make immense changes and eventually these changes were brought about. At last, with my perceived securities removed, with no job, relationship or any of my other previous responsibilities, I set out to experience my new lifestyle with ‘this thing’ called MS. I focused on my rehabilitation, spent time with family and friends and avoided any stressors that would trigger an exacerbation. Easier said than done! A major part of my rehabilitation involved consultations with Raman Das Mahatyagi, a long time friend and gifted Vaidya (Ayurvedic physician) who continued treating my vitality loss with natural plant and mineral medicines from the Himalayas. His Ayurvedic clinic was in Kathmandu Nepal until he moved to commence practice in Sydney. Ayurveda is an ancient Indian healing system, which places emphasis on restoring /balancing the internal life force as the fundamental of all treatment. Ayurveda provides us with the tools to understand our nature and live in harmony with it. Over the past 3 years, I have been blessed to receive chiropractic treatments in conjunction with Neuro-Emotional-Technique (NET) sessions ever so skillfully facilitated by another gifted practitioner and friend, chiropractor Matthew Bourke. Chiropractors believe that spinal joint misalignments, which they call vertebral subluxations, interfere with the body’s self-regulating mechanisms via the nervous system, resulting in bodily dysfunction. I chose these healing modalities as they all aim to balance the innate vital force, and each uniquely affect healing on the cellular level. In November of 2004, I lay for the first time on the treatment table to receive my first ever craniosacral session from Simon Green, and another very SIGNIFICANT stage of my healing process began which led me directly to my journey to South America and the following results. This first session was an extraordinary birthing … the birthing of my heart. I felt the essence of Ayahuasca (known as Grandmother, and Vine of the Soul) pervading the surrounding space. I could smell Her, She held me in Her arms. She welcomed me Home. I have ever since experienced the firmness and gentleness of her wisdom teachings. For me, she is the purest teacher of the feminine spirit. One year later the work in my last few sessions in Nov / Dec 2005 found the need for my meeting with the Teacher plants urgently apparent and during those sessions I was shown virtual cellular healing. I saw the mitochondria, the very DNA and I immediately recognized this as the site of my healing. Spirit was directing me to The Medicine. It was time. Simon concurred and I was ready. Naturally, Simon wanted to revisit with Grandmother Ayahuasca again, and my process was directing us both to San Pedro via Dr. Hampejs. At that time, we were the only partakers. However many obstacles prevented our attendance at Valentine’s 2005 Xmas Ceremony Gathering. In the end, a delayed departure in late January saw Kerrie and Justin join us for the very big adventure to Venezuela. We arrived in Mérida on Thursday 2 February 2006. I was elated to be meeting the smiling eyed Valentin at the airport. At last, we were here! We all embraced each other, jumped into the 4 WD and were off to our posada (inn) where we spent the next two weeks. On the way there, whilst some were experiencing motion sickness from the winding drive up the mountains, Valentin was quizzing me on my current and past health situation and what signs and symp-toms I had presently. I had a distinct feeling he was scanning all the personalities around him. Valentin and his beautiful wife Edna settled us in to our new home and left us with the following instructions: to fast the night and the day before each Ceremony. We would be collected at 2.30 pm on the day of the Ceremony and driven to Valentin’s property, where we would gather by 3 pm at the Ceremony site to prepare for the all-night rituals. After our long flights, we gladly spent the next few days resting in preparation for our first Ceremony on Sunday afternoon February 5. On the afternoon of the first Ceremony, Simon and Valentin spent time consulting with each other then joined us at the Ceremony site, along with Edna. After this discussion, Valentin announced to Kerrie, Simon and Justin that they had been given new spiritual names and they were instructed that these names were to be utilized for the duration of time in Ceremony, and whilst living together between Ceremonies. Curiously, I was then instructed to choose my own name. In retrospect, I feel that at this very moment the spirit of the plants was already entering my heart. I immediately found myself choosing the Hindu goddess of abun-dance, LAKSHMI (pronounced Lucksh-mee) and during the coming rituals, I became aware that I was invoking and immersing myself in her qualities. As I uttered her name I found myself emptied of the immense apprehension, of which I am not hesitant to tell you, I had lots! I was aware that opening to the flow of what was happening in the moment was what I had always wanted. In Ceremony Lakshmi guided me to remain open to the mystery, open to the energy of the plants, open to keeping the way clear in order to allow the plants’ energy to move through me freely. I have always loved the sound of her name – Lakshmi – it is a luscious, juicy sound, the sound of flowing water, a name full of life force. AII of these images highlighted what had been taken from me because my nervous system was so frayed and so fried. And so with our new names in place we gathered to hear Valentin give us a Super-Download of the content of his book ‘Shamanic Ecstasy of Consciousness’, published in German. Luckily, we got the English version – Valentin speaks numerous languages and occasionally likes to mix it up! We then proceeded to lie down for a tobacco juice hit administered via nasal ingestion. Believe me, you don’t want to know!… but for those who do the reason for the nasal ingestion of the tobacco juice is that the nasal nerves are the shortest of the human body going directly to the brain, thus the tobacco can stimulate it very directly with its medicinal vibration. After three hours of protective and purifying prayers and invocations offered to a cross section of deities (both Christian and Vedic, as well as the celestial archangels and indigenous warrior ancestors) it was now time to drink! My ignition (actually that should read initiation but it works just as well!) began with being offered the first drink! Equally surprising was that I was offered the combination of Ayahuasca and San Pedro. I had been expecting to take solely (soulIy?) San Pedro for all my healing ceremonies. In my internal story, it was to be just Shiva meeting with Ayahuasca this night. However, to challenge the maestro now was not appropriate behavior. I recovered, jolted into thinking if you are going to have expectations then EXPECT THE UNEXPECTED. I strongly focused my attention on my healing intention now, I respectfully swallowed the glass of the Divine brew. Durga, Shiva, Christopher, and then Valentin followed suit. It looked far from divine and was the most uninviting brownish blackish greenish tamarind, most viscous looking, and bitter tasting liquid. In addition, everyone’s face showed it! We now settled round the site with instructions to keep the medicine within for as long as possible. Maybe an hour or so passed. I felt overtaken by a drowsy dreamy state of lethargy followed by a sense of peacefulness. This was followed by feeling distinctly chilly. Then the urge to purge just took over! I thought ‘I’ll just stand up and go throw up.’ Simple! However, in the process of getting upright immense waves of dizziness took over. So much so that I had to hang on to the bamboo poles that supported the roof over the site. Despite that, the urge continued to force me out, still very unstable, to the field for my first heave! I did not stay in the field long first time round. PUTRID matter being thrown upwards and outwards. After successful results in this newly recognized art form, I maneuvered my way back down the path and I recall looking up to see Shiva, Durga and Christopher had all returned from the field and were sitting behind and at the side of the sacred fire. However, I found myself sitting on Valentin’s seat in front of the sacred fire, mainly because I could not stagger another step further! There was to be plenty more stagger, stagger crawl crawling to be had in future ceremonies. Oye! Valentin was not far behind me. He then prepared a strong substance called Agua de Florida to settle my stomach. Gracias! It made a huge difference to the nausea I was experiencing. Valentin sat down beside me and began to sing more devotional songs. We all sat. The hours passed, Valentin’s story telling continued. On this particular night, one of those stories included a body story belonging to me – a story that led to a healing in that very first Ceremony. As I said Valentin was sitting next to me on the wooden seat from where he directed Ceremony, quietly puffing on his pipe when he suddenly turned to me and asked had there been abuse in my family? “No!” I said but I really felt that what he meant was had I been abused. You mean me?” I asked to clarify. I was silent, unable to answer immediately. I found myself swinging my legs like a ten-year-old girl, feeling withdrawn but drawn into the spotlight to reveal a story I did not even know I had! This situation made me feel very uncomfortable. I felt really vulnerable and exposed in front of those present who were not familiar to me. Bear in mind that I was feeling completely incredulous at the direction the Medicine was taking, and all my responses seemed to me to be much labored. I said, “Err … umm …,” The ten year old was starting to remember some things. “Yes or no?” asked Valentin firmly. “Aaaaaha! Hmmmm…” was Valentin’s response. I have read since my return home that the goal of the maestro curandero is to make his patient “bloom” during the ceremony, to make the subconscious “open like a flower. This proved to be a most beautiful and perfect metaphor for the night’s unfolding. Valentin and I were now facing each other, with me still incredulous at this discovery, when suddenly the Medicine began to speak to me directly. I felt as if the Medicine had taken over my body searching, investigating my cells. I observed Valentin’s smiling face morphing into the most exquisite slideshow of geometric and filigree patterns. I remained lucid yet I was sensing the Medicine weaving and coursing through me in the same way that the patterns were dancing on Valentin’s face. Nature’s consciousness expressing itself magnificently to me. The moment I surrendered to the Plants’ wisdom, I felt my cells receive the gifts with which I had hoped they might deem to grace me. It was a powerful, definitive and humbling moment, a moment that still takes my breath away at its memory. During this night’s healing, my soul finally released the guilt imposed upon me by Catholicism during my childhood, as punishment for having my sexuality awakened at an early age. I had unconsciously been burdened by the impact of this, my “soul’s wounding”. Archaic wounds tend to be locked away in the body, stored in a kind of time capsule. When you reach them, the body tends to lock – freeze up, as when startled, but if there is enough trust present, the memories begin to unwind and the time capsule releases its contents. The client will be back in the event, experiencing all of its smells, sounds, sights, and distress. For almost half a lifetime, the Plants’ wisdom dramatically revealed this wound and with seemingly impeccable timing proceeded to reveal and bestow the healing wisdom of true forgiveness and compassion upon me. Forgiveness heals guilt. If there is no forgiveness the wound works its way deeper. The body stiffens, for movement accesses the wound: we also avoid deep feelings lest they touch it. human beings fulfilling their agendas. -Taken from the Heart of Listening by author and Craniosacral Therapist Hugh Milne. There was more releasing, and then more releasing and I believe more releasing over what felt like most of the early hours of that morning. I found the relentless intention of the Medicines to be a loving yet firm, gentle yet tough initiation into their wisdom teachings. In those early morning hours, with my ‘supreme ordeal’ appearing to have subsided, I peered through joyful tears across and beyond the sacred fire to acknowledge and honor the protective presence of the powerful Guardians surrounding us all during the night’s Ceremony. My focus then moved to my tribe around the fire. There I discovered I was the recipient of a powerful stream of unconditional love. This was flowing into me from the beaming smiles and happy hearts of Shiva, Durga and Christopher. They had travelled with me all through my initiation and vigilantly held space for me through that remarkable and miraculous night. Feeling euphoric, I turned to my left and there was Valentin sitting beside me once again, looking into the fire, puffing on his pipe as though he had never shifted the whole night. The Medicines and the Maestro, what a blessed collaboration of powerful healing forces. I was indeed in fine company all around! The sound of the church bells tolling at 6 am informed that dawn was approaching and the greatly anticipated Water Ceremony would soon be performed. After no water for 12 hours or more it was sure to be sublime nectar. Along with the sun’s arrival over the mountain’s ridgeline came Edna to perform the Morning Offerings of Thanksgiving and to partake in the Purification Ceremony. Our next exquisite moment was one of basking in the new day’s sunshine, communing over Edna’s delicious breakfast. Every mouthful a blissful taste explosion. And so our first night’s ritual drew to a close. There are so many stories from every other Ceremony to share and to detail here would take pages. Instead, I have chosen and dramatically condensed some of ‘The Moments’ from each, knowing that language is inadequate to express these most EXTRAORDINARY, SOULFUL and LIFE- CHANGING experiences. I went on to do another five ceremonies. One of these ceremonies was a 4 hrs. SHAMANIC POWER HIKE up in the Sierra Nevada mountain jungles where we ingested San Pedro at a Ceremony site about 1 1/2 hours into the hike. After another hour, we arrived at the waterfall named Dragon’s Veins! There each of us underwent an intense and powerful energy healing. The healing trans- missions and communion with nature and animal spirits was potent for everyone. I was leaning against a boulder warming in the sun when Valentin appeared beside me. I turned to him and placed Shiva’s Akubra hat that I had been wearing onto his head. In an instant, he had morphed into a beautiful Aboriginal Elder whose smiling face then shifted to one of immense anguish. I felt this Elder’s heart breaking; I felt his devastation and the overwhelming grief for the wounds of his people, our indigenous brothers and sisters. The instruction from San Pedro was that we must find the Elders to affect the healings. Somewhere in our tears, the Elder approached me to make the most desperate plea of a promise to quest this healing. 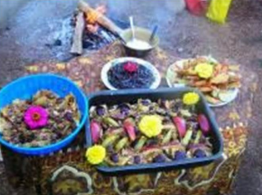 The fourth Ceremony was solely with Ayahuasca. In this Ceremony, I found myself initially dealing with most of the symptoms the disease entity had delivered in my initial attack, which you have read about already. I was spared the headache. Gracias Grandmother! I was very concerned about these symptoms but Valentin assured me they would pass after more purging. After MUCH more purging and saying to myself and to Durga that I will NEVER do this again, I crawled my way back to the fire still accompanied by nausea and dizziness. I found myself sitting upright, still and silent for most of the long hours of Ceremony between many bouts of crawling to purge out in the field, and at some point after the nausea and dizziness subsided, in my stillness I was delivered into a state of grace, my heart overflowing with love, the receptor of profound healing transmissions from Grandmother Ayahuasca. Again, She welcomed me Home. Sadly, Durga made her departure a few days after this Ceremony to return home and this void in the group process found us making a decision to post pone further Ceremonies, giving the three of us a much needed rest to allow further assimilation and integration of the Medicines. Six days later, after several group discussions, Shiva, Christopher and Valentin partook in another Ayahuasca Ceremony. I chose to rest and assimilate for another few days. Our final Ceremony included two Ceremonies in one day, another Shamanic Power hike and an evening Ayahuasca Ceremony. This time we took a two-hour walk into the Andes Mountains near Valentin’s home to partake in another amazing waterfall dowsing at Los Leones (The Lions) and to ingest San Pedro. Again, the elemental presence was very strong at this site. While Christopher and Shiva returned to commune with these elementals at the waterfall, Valentin and I discussed mythology and Jung by the fire and San Pedro shared his emotional version of the Grail Myth for me. Sadly, it was soon time to return. I experienced strong hallucinatory effects along with a somewhat legless state on the walk (not helpful when one is hiking) back to Valentine´s house. In also felt a distinctive hardening on entering civilization. Arriving at Valentin’s home, I found that lying down on the earth next to the San Pedro garden was the Panacea for that hard edge sensation. There the three of us lay totally blessing out on Pachamama (Mother Earth). A heart space that remains with me forever! Shiva’s rest was brief, his work commencing again with the need to attend to the immense energies present. Soon the all-pervading sound of the Yidaki was heard with Shiva delivering the landscape a most powerful healing. Now with the dark entities powerfully forced out and the intensity eased off the transition into the evening Ceremony was apparent. Valentin suggested we continue on down to the Ceremony site. By 5 pm, a long day had passed already. I felt done or perhaps I was just undone. This feeling was soon turned around by the enjoyment of watching Valentin, Edna and their children, Alejandro and Emmanuel as they prepared the site for the evening’s ritual. The magical swordplay of Emmanuel, their youngest son, in particular was a delight. This was followed by a visit from Mescalito, the playful and mischievous spirit of both the San Pedro and Peyote cactus. He had come to meet with, and acknowledge Valentin for his long and devoted service. I was hoping he would stay for the whole night’s Ceremony as I found their heartfelt camaraderie and Mescalito’s energy most uplifting. I felt a shared disappointment between the three of us at his departure. Three hours later with Valentin’s protective prayers and invocations completed, it was time to drink. We respectfully drank of Grandmother Ayahuasca. The night ahead proved to be long and labored with lots of purging. The indigenous warriors of the earth surrounded us this night. The Yidaki sang the spirits of the Australian Aboriginal into Ceremony, expressing their grief at the damage caused to the land and her people. We cried the painful tears of the land and her people, and cried the tears of all of us who are so sorry. The purgings seemed to occur with synchronicity at times with The Medicine showing me scenes of environmental harm, sexual themes and delivered profound transmissions from Mother Earth showing Her healing through women, sacred dance and song. The Church bells at 6 am then the Dawn and the Water Ceremony provided an immensely welcome respite and some relief from the night’s predominantly dark and arduous ritual. A few hours later, the arrival of Edna to offer Thanksgiving and Food drew our final Ceremony to a close. On the following Sunday March 5, after heartfelt farewells with Valentin, Maria and family, Shiva and Christopher accompanied me to Mérida Airport to begin my return home. I sadly left my brothers there and flew to Caracas then onto Buenos Aires. There, I, the dancer, slipped on my shoes and danced the Tango! NO SIGN OF THAT DEBILITATING FATIGUE! To the Goddess Lakshmi for delivering her abundant graces. With the deepest Gratitude, I honorably bow to the Sacred Teacher Plants. For gifting me their healing wisdom. For their powerful and precise insight into my wounding and for deeming to share with me by direct transmission information in respect to the healing of this ancient land and her people. Thank You. With the deepest Gratitude, I honorably bow to Mescalito. The spirit guide of the San Pedro and Peyote cactus for gracing us with your DeLightFul company during Ceremonies. Such a privilege to experience your energy, Senor. Thank you. With the deepest Gratitude, I honorably bow to Shiva my precious brother. Om Namah Shivaya. For your human beingness. For revealing to me who I Be. worlds, you move in. For your unbelievable abilities in the employment of your extraordinary gifts. For holding my hand all the way to the threshold. For your ever constant and dutiful vigilance in this realm and those beyond. For your humility and your humor. I am forever blessed to be your hermana. Thank you. With the deepest Gratitude, I honorably bow to dearest Valentin. For your masterful facilitation of the Shamanic Ecstasy of Consciousness. Christopher stated in one of his tales of you “Shaman of experience and pedigree not explicable without sitting with him.” Well, I have sat with you in and out of Ceremony and most readily concur. Shiva and I both felt you to be ‘Our Man in the Andes’ well before meeting you and little time passed in your company before our heart’s knowing was confirmed. For your constancy of care, love and warm hospitality during our stay with you and your beautiful family. Valentin your faith, compassion and humility is an inspiration. With my utmost respect and love. Thank you. With the deepest Gratitude, I honorably bow to Durga. For BEING THERE! How unthinkable that you nearly did not join us! We have shared many amazing experiences to date but some of the experiences shared in Ceremony and on this journey felt to be, for me, the poetic expression of the beauty of our soul’s connection. Your part to play in the group process recognizable your departure a huge void for us and a painful separation for you, precious sister. For your loving hand of friendship by joining me in support of my healing and for your constancy of care, protection and concern all these years leading up to this journey. Thank You. With the deepest Gratitude, I honorably bow to dear Christopher. For your constant encouragement. For your very own Saint’s patience with my attempts at Spanish conversation; for sharing your precious “Oreos” with me; for all the fun you provided, all the laughter (you have much joy in you!) and all the tears. Christopher, in your wildest dreams would you have ever envisaged such physical, emotional or spiritual rides and encounters as those extraordinary moments of Battle and Bliss we experienced and were witness to? For sharing it all, brother. Thank you. With the deepest Gratitude, I honorably bow to Edna. Our hearts connected at our first meeting and remain so. I will never forget your loving support during our stay in Venezuela. I will always remember your beautiful smiling face greeting us in the morning sun, to share your prayers of gratitude and heavenly breakfast, after our long nights of Ceremony. Our experiences have connected us all forever. Thank you so much heart sister. With the deepest Gratitude I honorably bow to you dear reader for hearing the stories of my human soul’s wounding and that of our precious Mother Earth’s. Thank You. I leave you for now with the following lines from “Here All Dwell Free” by Gertrude Mueller Nelson: Our responsibility, then, is to find and know the story that is our own. We then reach out to grapple with it, choosing to suffer the conflicts that pull us back into our fate and forward to our true selves. As we become healed and autonomous, we re-enter our community and our history, offering our gifts to benefit all and taking our place as co-creators of our personal and communal destinies. AII three of these tasks, though developmental in nature, are not necessarily done in stair-step order, but cycle around and around, deeper and deeper, as we grow in consciousness and responsibility…. Only where we allow ourselves to be fully human can Spirit meet us, and here we encounter our true selves, as if for the first time. Here all dwell free.